What do Christmas, Federico Fellini and my grandfather have in common? 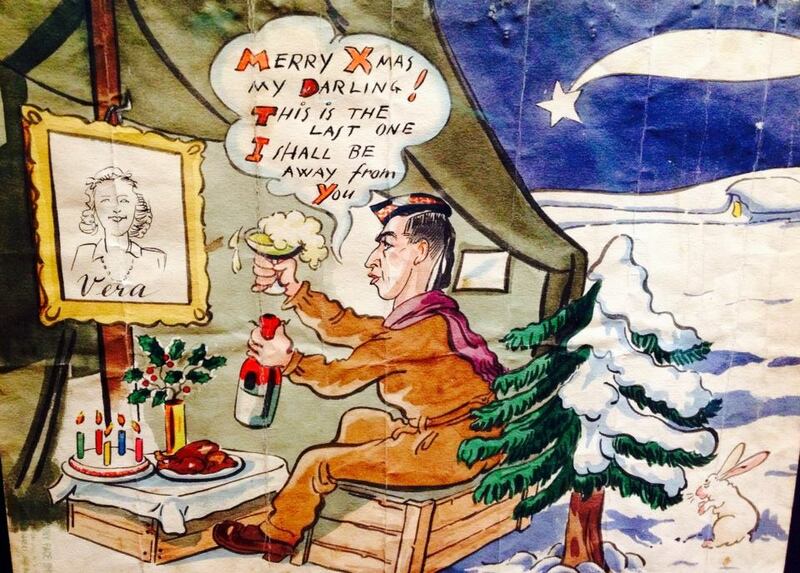 And it was the last Christmas he was away, shortly after this drawing was made my grandfather was injured and was eventually discharged and made his way home in April 1945. Drawing from the “Funny Face Shop” in Rome, 1944. 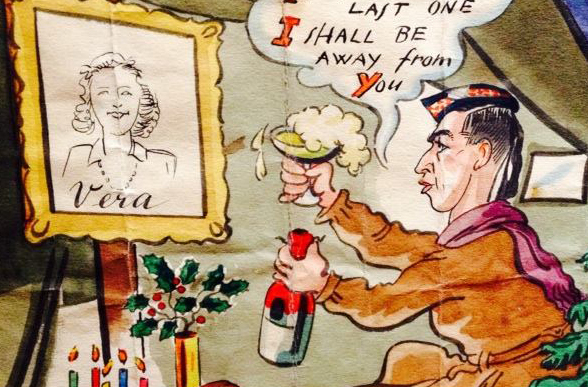 My grandmother received this charming drawing all the way from Italy in December 1944. Which, coincidentally, happened to be around the same time that my grandfather was injured at the Lamone River in Italy. For some reason, it was only recently that my mother noticed the information on the reverse of the image. According to the stamp on the back of the drawing, my grandfather got it from the “Funny Face Shop” on Via Nazionale in Rome. Imagine our suprise we we learned that the “Funny Face Shop” was once a wartime venture of Italian film director, Federico Fellini! Before he was world famous film director and screenwiter, Federico Fellini drew caricatures for a living during the chaotic period that followed the liberation of Rome in 1944. Fellini first came to Rome in 1939, ostensively to go to University. However, that was not the case. After a few missteps, he eventually began working for Marc’Aurelio, an Italian satirical magazine. During his time at Marc’Aurelio (1939-1942) Fellini connected with other writers and screenwriters, and he eventually began to write for radio and films. After the fall of Mussolini in July 1943, the situation in Rome became desperate – as portrayed in the film “Rome, Open City” or “Roma città aperta” [More about that later]. By June 1944, when the Allies liberated Rome there were shortages of everything. The social system had broken down, and there were people who didn’t have a place to live or food to eat. Federico Fellini struggled to find work. There was no work in film, radio drama or newpapers – all fields that Fellini had worked in previously. So Fellini decided to fall back on his “boyhood career” as a portrait artist when he and Demos Bonini opened a portrait shop called “Febo” in the Italian town of Rimini. 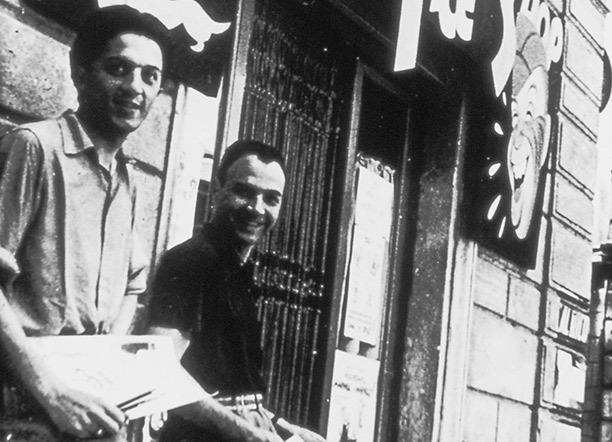 Together with a few writer and film friends (among them Vittorio De Sica) Fellini opened a caricature shop (una bottega della caricatura) called the Funny Face Shop on the busy Via Nazionale. At the shop they drew thumbnail portraits and caricatures (by Fellini himself) of the Allied GIs for delivery overseas. Though American soldiers were the shop’s main customers, soldiers from other Allied countries also visited the shop. One such Canadian soldier was my grandfather Pete, who was serving with the Seaforth Highlanders. Sometime in the fall of 1944, my grandfather was in Rome and visited the Funny Face Shop and posed for the drawing above. Fellini and the other artists at the Funny Face Shop created a series of vignettes or “scenes” of amusing situations: a soldier at the Coliseum that killed a lion, or in Naples on a small boat that fished a mermaid, or a soldier at the Trevi Fountain. Each situation was reproduced in multiple copies where the head of the soldier consisted of an empty oval space. The soldiers would arrive in the shop, choose a scene and then pose for Fellini to add the soldier’s caricatured features to complete the scene. In my grandfather’s case it was a sentimental Christmas scene that included a quick sketch of my grandmother. Detail of drawing…an original Federico Fellini! The shop became a meeting place for the soldiers – Fellini likened it to a saloon in the old west. One evening when the shop was crowded with soldiers in sauntered film director, Roberto Rosselini. He was here to talk to Fellini about his new film project on the life of Don Morosini. Rosselini wanted Fellini to collaborate on the screenplay and convince his friend, actor Aldo Fabrizi, to take part in the project. That film about the life of Don Morosini became the Italian neorealist film, Roma città aperta (Rome, Open City). The rest, as they say, is Italian neorealism history. Shooting for Rome, Open City began January 1945. The film was possibly still in production by the time my grandfather returned home to Vancouver in April of 1945. 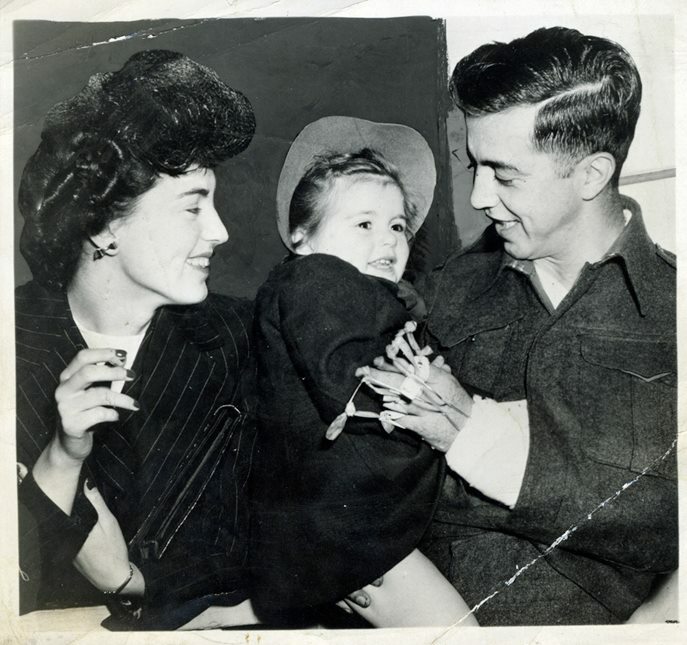 My grandmother and mother (3 1/2) greet my grandfather at the CPR station in Vancouver, April 1945. This photo was taken for The Province newspaper. Unfortunately, I haven’t been able to find any other “Funny Face Shop” drawings. 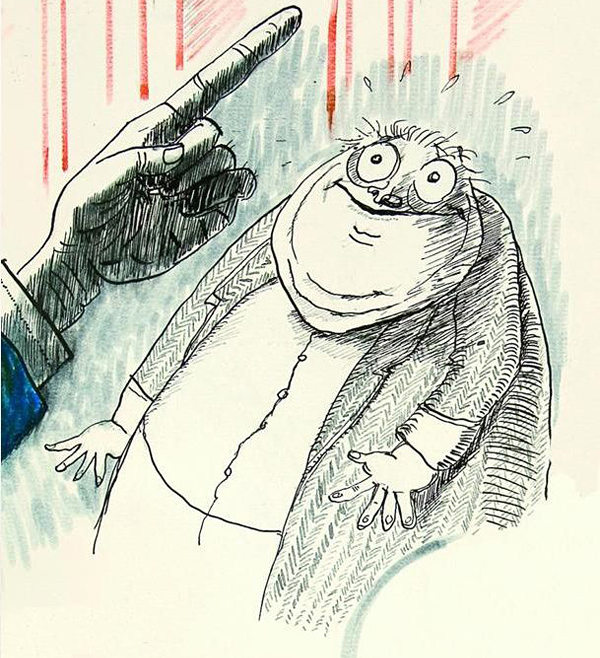 However, more of Fellini’s later drawings and caricatures can be seen here. Thanks! Apparently, there were other copycat shops that were modeled on the Funny Face Shop around Rome at the same time…maybe it comes from one of those? What a great story and presentation. Thank you & Happy New Year! Thanks Kelly, glad you enjoyed it. Glad you liked it. Fellini is a pretty interesting character and filmmaker.